There are a few things that will always remind me of Leo Coller. One of them is homemade chicken noodle soup. My husband has always raved about his dad's homemade chicken and noodles and it doesn't matter how many variations I come up with, I never have made it, "just like Dad's". Still, this recipe gets lots of compliments around our table, even from Jamie, so I suppose I'll have to just let his Dad be the chicken noodle king and I'll live happily in his shadow! The process of making this homemade soup is actually very simple, but the fact that it's all homemade makes me feel all Ma Ingalls-ish. It's a great low-cost recipe that feeds a large family. I suggest grabbing several of these whole chickens when you find them on sale and just storing them in the freezer. Sometimes you can get them for as low as .60 a pound---which would make your whole meal cost less than $5 for about 12-15 servings. I never worry about cutting uniform noodles. 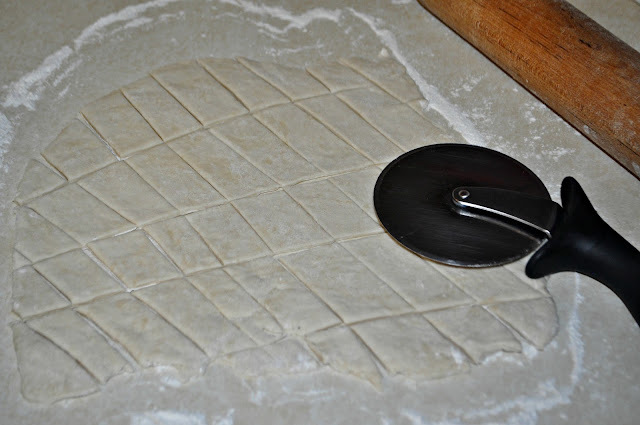 I just roll out the dough to about 1/4" and cut through it quickly with a pizza cutter. Super easy! De-boning the whole chicken will give you enough meat for 12-15 servings. Some people only use white meat in their chicken noodle soup, but I say, "bring on the dark meat!" 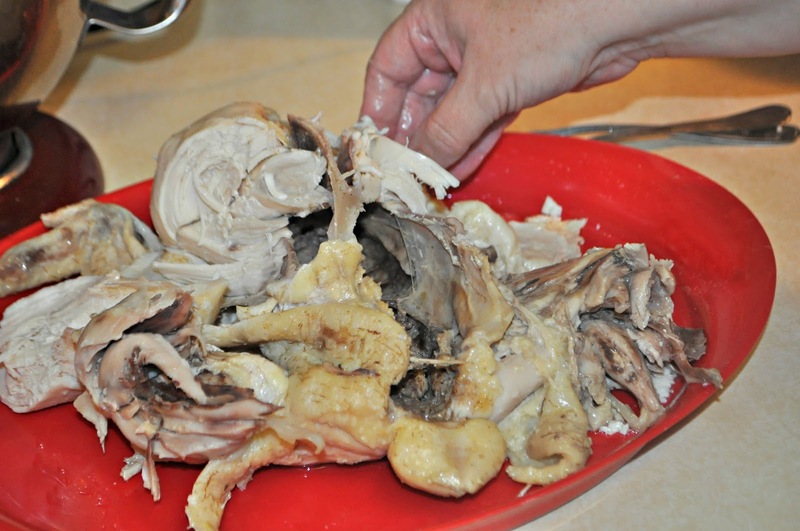 If you really must only use white meat, stick the rest of the bird in a large freezer bag and store it for making homemade chicken stock or broth later on. Here's my recipe for Homemade Chicken & Noodles. Let me know if you give it a try! Put the chicken in a large stock pot and cover completely with water. Bring to a boil, then continue cooking chicken for one hour, or until cooked through. I like to turn it over now and then, and poke it with a fork to make sure it's getting done all the way through. When cooked, remove the chicken to a platter to cool. While chicken is cooking, make the noodles. 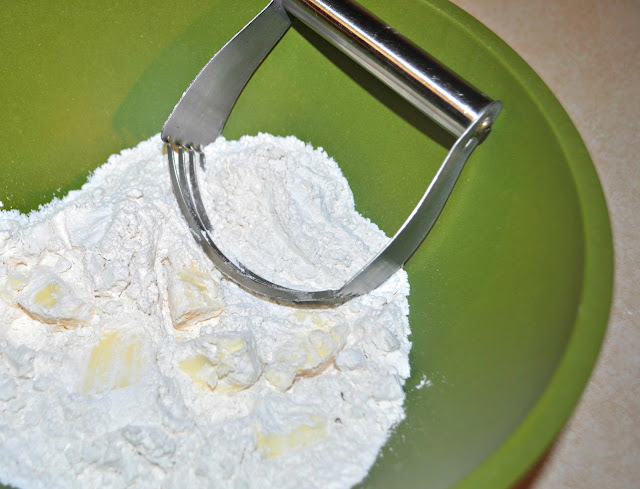 Start with 2 c. of flour in the bowl. Add 2 tsp. salt and 4 TB of butter. Use a pastry blender to mix it up until it's the size of small peas. Add 1 cup HOT water and and 1 1/4 c. of flour to the mixture. Stir and work the mixture until a soft dough ball forms then break off about a third and roll it out to about 1/4" on a floured surface. Cut the dough into strips using a pizza cutter. 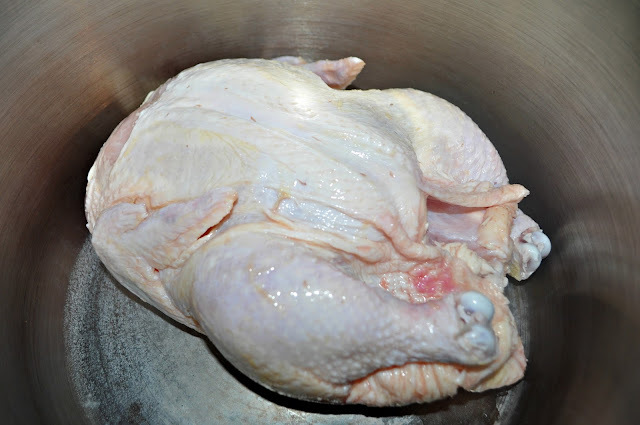 If the chicken is done at this point, remove the chicken and begin adding the noodles, one at a time, to the still boiling water. If the chicken is still cooking, layer the noodles on wax paper and continue rolling them out. They'll be fine on the counter for awhile until the chicken is done. Yum... this makes me very hungry! This makes me very hungry! Looks like a good dish to try on a cold day. This reminds me of my mother and my husband's grandmother. Both of them made fantastic homemade noodles with chicken. Hubby's grandmother always made a great angel food cake with the egg whites leftover from the noodles. Happy to be your neighbor today at the Linkup at Mom's the Word. 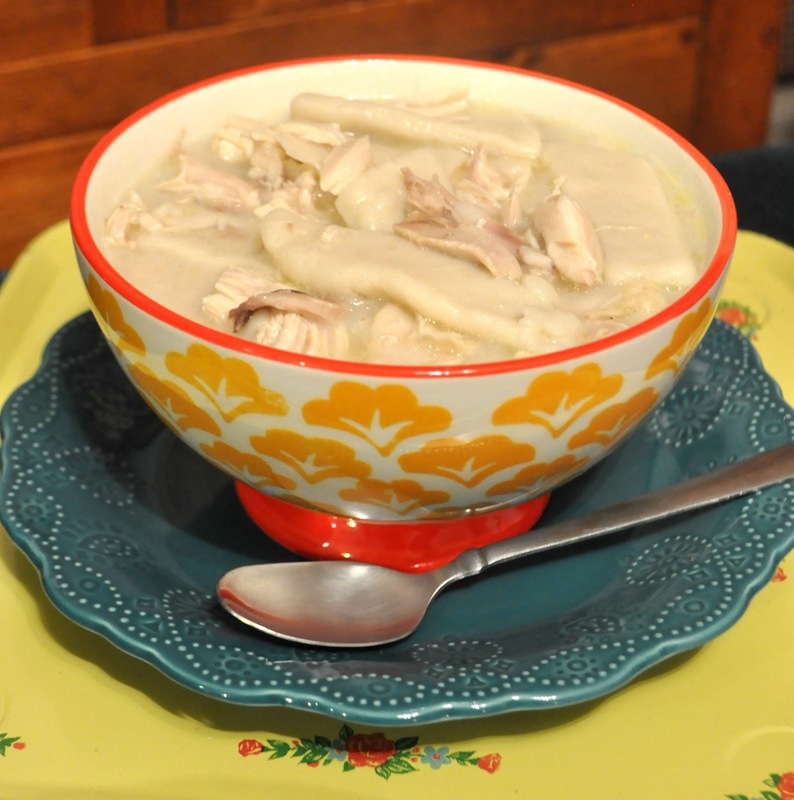 Chicken and Dumplings -- food for the soul! I can see my Granny busy in the kitchen. Thanks for the memories and yummy recipe! Your soup sounds wonderful. I love a home made chicken soup. Thanks for sharing and linking. Yum! This sounds delicious! I've never been to fond of the two knife method either, I usually end up with my fingers in there instead so that I can feel the consistency. 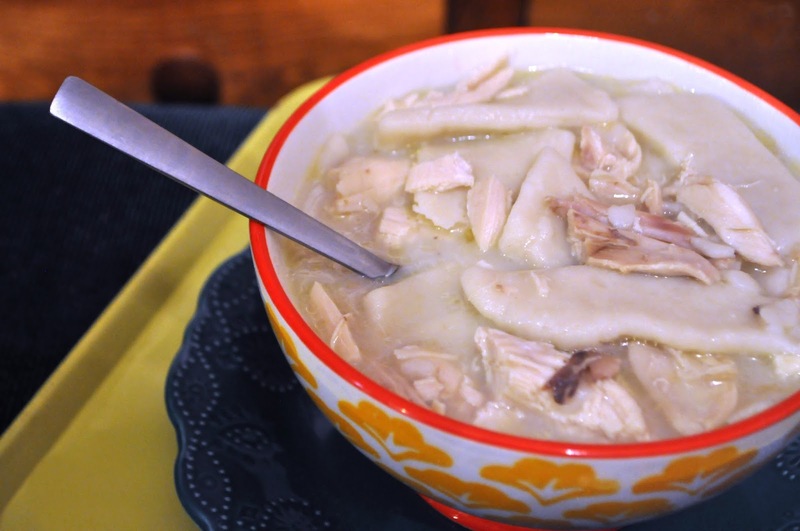 Chicken and dumplings are one of my favorite comfort foods and I haven't made them for many years. Thanks for your recipe, I'll be trying it! oh my - what a great meal and would be loved by everyone. I make this too and the house always smells so comforting! I really think perfect with hot bread and cherry pie! I think I am craving cherry pie! Thanks for sharing and linking. This looks absolutely delicious Sarah! Thank you for sharing with us this week on the Art of Home-Making Mondays at Strangers & Pilgrims on Earth! My mom made the most delicious homemade chicken noodle soup. I still make it today. Her signature style was that after she dished it up she put a dollop of butter on top and then added a boiled egg sliced in half. It really is a delicious bite! Thanks for sharing your recipe with SYC. Nothing beats homemade chicken noodle soup. This looks delicious Sarah! Thanks for sharing at Home Sweet Home!